Preservation is about change. Our buildings must be adaptable to survive. We need to envision new uses for structures that are obsolete by modern standards. The two-story Collins Building at the corner of Madison and Oak Park was built in 1922 with retail storefronts on the first floor and offices and apartments on the second floor. The elegant structure was planned without parking — an urban building that was built up to the sidewalk — defining the urban streets. The well built, Classical Revival building retains much of it historic detailing, including a rounded corner entry, limestone trim, and a stone cornice and parapet. Walgreen’s first choice was to tear down the building and erect another (7,500 current locations) bland cookie-cutter windowless box with a squat corner ‘tower’ facing the parking lot; a prototype indifferent to its location or context. Following months, make that years, of meetings with village staff, homeowners and community groups Walgreens listened and their architects responded with a design that is commendable. The main goal that came from the community was to save and redevelop the Collins Building. The community and the preservation commission recommended that the addition was not to mimic the Collins yet be respectful to its scale and materials. The parking lot was to be placed on Madison Street, screened by garden walls, benches and landscaping. The new design continues to provide goods and services to the immediate area plus the convenience of off street parking and a critical new drive thru for prescription pick-up. I am happy to report that this design does much more than the cookie cutter program demanded by the national chain store. This pharmacy-store is a model of what the future could bear for retailers interested in entering historic communities. Here we have a design that is sensitive and inventive to one of the most beautiful and historically significant communities in America. The lead architect, Ted Theodore of Camburas & Theodore as well as Walgreens, should be commended for their instructive work of architecture. The greatest challenge technically was to preserve the two-story façade. This led to employing a steel girt and wind column system bracing the two-story wall, while allowing for selective demolition. The entire obsolete interior, roof and basement were removed and a new foundation and steel structure inserted. A discreet loading dock and drive-thru facility was built on the south side, accessed via an alley. Interesting back-lit vintage Walgreen’s photographs were framed and mounted in the storefronts. disguising the dock and bringing interest to the street. On the Madison Street façade, the storefronts are left open exposing the two-story interior, which is contrary to contemporary chain store strategy. Most of the prototypes reveal little of the interior, opting for the sealed box esthetic, rendering a lifeless edge to the sidewalk. This handsome addition to the west contrasts and compliments the Collins Building materials and language. The addition is decidedly modern, set back to break with the rhythmic two-story classicism. The glassy façade presents a welcoming elevation opening to the landscaped parking lot. The materials shift from a buff colored masonry wall to a deep colored iron-spot brick with limestone details. Traditional quoins or offset brick details of the Collins are transformed into an eloquent pattern of brick bands. The metal storefront finishes contrast from a deep bronze to a modern clear anodized finish. The striking two-story glass corner entrance is clearly defined, complete with tastefully scaled signage. A long horizontal sheltering projection welcomes customers to the entrance. The dramatic interior space is two stories high and filled with natural sunlight, reducing its need for energy-consuming artificial lighting. The attractive polished concrete floors are heated by geo-thermal energy. 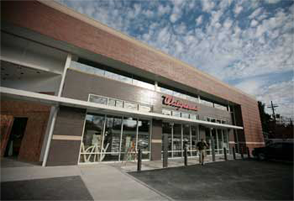 This inventive and responsible project is a credit to the community, the architects and the Walgreen’s development team. Let’s be clear, this unique project was realized because the community demands were met after Walgreens bent their development rules. We now have an everyday building elevated to the noble status of architecture. Could this very successful company continue now to do the right thing in other locations across the nation? Garret Eakin is a practicing architect that has lived in Oak Park for 20 years. He is also a preservation commissioner and an Adjunct Professor at School of the Art Institute.